Uni Watch broke the story. A couple of years ago, the NBA made a lot of fashion-forward fans gag when it had teams wear sleeved nonsense for their special limited edition Christmas jerseys. Last year’s jerseys were OK if somewhat bland. This year’s jerseys leaked Wednesday, and … they’re nice! See, we can have nice things! 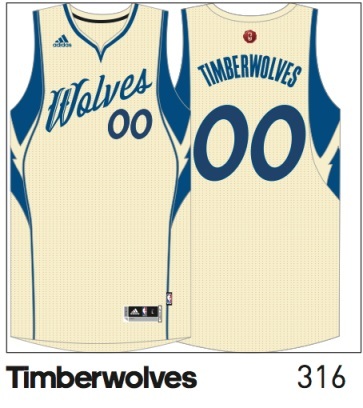 (Those are the Wolves jerseys you see, in case that wasn’t obvious). Uni Watch broke the story (so much as jerseys are a story, but still a great get for the site) and has images of all 30 right here. As the site notes: Remember, we don’t yet know which teams will be playing on Dec. 25, or even how many games there will be on that date, because the NBA hasn’t yet released the 2015-16 schedule. (For reference, last year there were five games on Christmas.) So we won’t be seeing all of these designs on the court, but the designs were developed months ago, so they did one for every team, just in case. That said, as someone who hasn’t bought a jersey in more than 10 years … those are tempting. Very tempting. How would have the Wild fared if the NHL hadn't realigned its divisions?